After assessing DePauw, Dartlet, a reputation strategy company, announced the University’s perceived personality traits and the personality DePauw should strive to embody in order to effectively communicate to the market in their reveal on Feb. 16. Additionally, Dartlet provided findings of DePauw’s personality on an average and ideal day that they found in their workshops with students and faculty to assess the personality. On an average day, DePauw typically sees itself as an explorer/discoverer, a guide, creator, and leader. On an ideal day, the University sees itself as an innovator, leader, trailblazer, and explorer. When discussing DePauw’s perception in the marketplace, Dartlet concluded that not a lot of people know the University in its major market places based on polling. “You’re the best liberal arts school in the state and not everyone knows it,” said Scott Ochander, co-founder of Dartlet. In DePauw’s four main recruiting areas, Indianapolis, Fort Wayne, IN, Chicago, IL and St. Louis, MO it was found that 43 percent of people polled had zero familiarity with DePauw. “It gets a little better when you think about radius. In Indianapolis, it’s only 20 percent [unfamiliar with DePauw], so one in five people in Indy have zero familiarity,” Borders said. However, people in between 18-24 years old were only 15 percent unfamiliar. It was then stated that 62 percent of people in St. Louis did not know DePauw. Following the reveal of DePauw’s aspirational personality, Ochander discussed critical next steps for the University to take in order to present itself better to the marketplace. Along with concerns of name recognition, the administration sought help from Dartlet to get a better understanding of DePauw’s personality. “People over and over said we need to know who we are. We need to stand for who we are. We need to have a clearer identity, and we need to have a clearer identity in the market, so that’s what prompted this work,” said President Mark McCoy. In its marketing strategy going forward, DePauw will more streamline its outward communications. “There’s a complete marketing plan that we’re embarking on to do digital work, to do digital advertising, a new website, to doing billboards, to doing mailers, the whole bit,” President McCoy said. 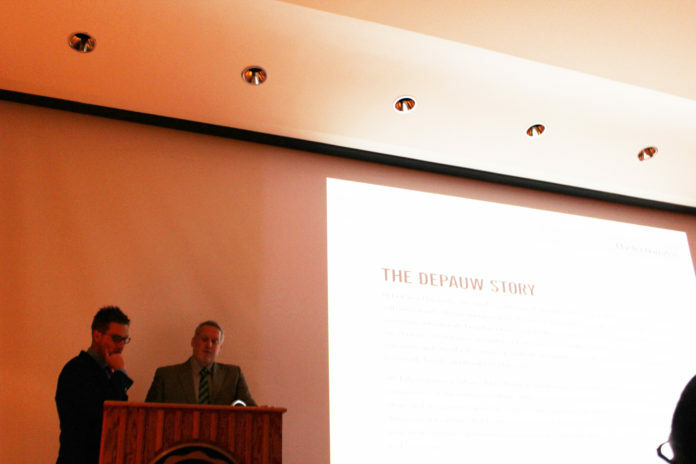 Nevertheless, Ochander conceded that it’s ultimately up to the students for DePauw to aspire to its personality traits of leader, discoverer and creator.